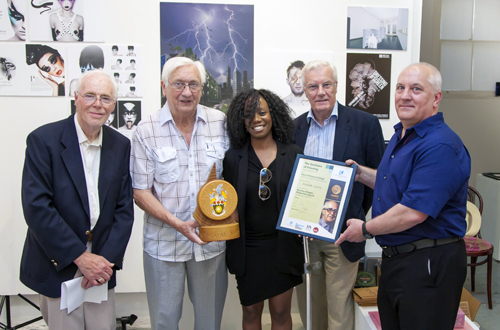 City of Bristol College graphic design students have been competing against each other once again in their quest for the award of The Stanley Hooper Memorial trophy. This last academic year has seen brilliance in the interpretation of a design brief orientated towards the future where interplanetary space travel has supplanted cross channel ferries, transatlantic voyages and economy coach trip facilities for family holidays. Kids don't quite go free but the utility services on board the average space ship, in detail, attracted imaginative ideas from notebook to graphics screening, all assessed and rated by branch members, trustees and co-opted studio personnel. This year's winner was a young lady, Michelle Curtis who had put a great deal into her interpretation of the brief, achieving a well deserved result. The Hooper award includes IP3 subsidised membership and work experience at one of the sponsoring companies, Bristol News and Media, of whom Creative Manager Gary Burt has rendered his customary wisdom and experience in coming to the final selection. Trustees Graham Hart, Roland Reed and Branch Chair Glyn Miller also took part in Bristol's CentreSpace Gallery presentation; a trouble-free event, on Friday 13th June.